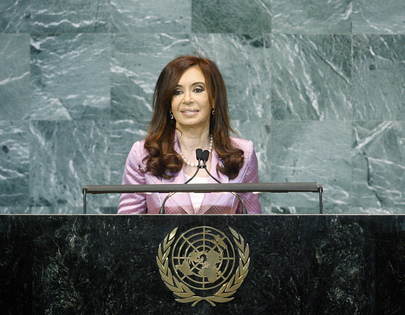 Cristina Fernández, President of Argentina, cited three high points heard in speeches given yesterday: fallout from the global economic crisis; impacts of climate change; and preservation of world peace and international security. “The emerging countries, especially Argentina have a good deal of experience in connection with these items,” she said. Developing countries were sustaining economic development and creating the instruments needed to overcome the economic crisis. Her country had been a “stellar student” in that regard, having experienced unbearable debts, and been unable to produce the goods and services needed. Thanks to a policy launched in 2003, Argentina had overcome various crises, relying on its own beliefs and interests. It had emerged from debt, renegotiated 93 per cent of all its debts, and had experienced unprecedented growth over the last year, thanks to counter-cyclical measures taken. Argentina boasted a 9 per cent economic growth rate over the last year and reduced unemployment to 7.9 per cent. She said that it was urgent to enact global legislation in the area of speculative funds and an evaluation of risk factors. Further, there was a need to reengineer, at the national level, multilateral funds. A new theoretical framework was needed, with new roles to be played by States that promoted fiscal measures for stable employment. Currencies should not just be seen in terms of monetary funds. A currency was directly related to growth possibilities. Wealth should be distributed fairly throughout society. Turning to climate change, she said that issue was of central importance and just, equitable solutions must be proposed, especially by polluters. It was unfair for developing countries to bear the burden of problems started by developed countries that had polluted for decades. As for building peace and security, resumed dialogue between Israel and the Palestinian Authority was “really good news”. During this session, she hoped to see a state of Palestine seated in the Assembly Hall. That would contribute greatly to global peace and security. On another important issue, she said that in 1994, Argentina had suffered a terrorist attack when an Israeli building was targeted. In 2007, the then-President had requested Iran to accede to Argentina’s request of extradition of officials that had assisted in the perpetration of that crime. Argentina’s system guaranteed a due process of law. If Iran did not believe in Argentine justice, it should choose a third country that could guarantee due process of law. “For us, it was an attack on all Argentineans,” she said. “All the Argentine Government wants is justice”. In connection with security, she asked for respect for sovereignty in the Malvinas islands, where the United Kingdom had refused to abide by General Assembly resolutions, or engage in talks on the question of sovereignty. There had been unilateral decisions to explore for hydrocarbons, which had damaged natural resources in an area 14,000 miles away from the United Kingdom. On ecological catastrophes, she said there had been a lack of control over the United Kingdom’s actions in the Malvinas. “We must reform our Security Council,” she said, adding that the United Kingdom had misused its position in that body. The Council thus far had not been able to preserve international peace and security. The world in which that 15-member body had been created no longer existed. Argentina had an enlightening case to make for the Malvinas. Only the developing countries were being forced to abide by resolutions and peace could not be built in such an environment. Concepts of peace and security could not be associated only with military matters; they also concerned equity, freedom and equality.